Stanley Kubrick spent a long time lost in the wilderness of The Shining, and perhaps fittingly for the famously meta-textual director, it has a back-story to match its on-screen horrors. Most famous is the off-screen feud between Kubrick and the author of the book the film is based off of, Stephen King. King’s voice was becoming increasingly popular when the film was released in 1980; he was on his way to becoming a genuine pop culture phenomenon, and his famous distaste for the film drew much media attention, so much that it threatened to overshadow the film itself. Thankfully, Kubrick was an imposing, conniving, controlling maelstrom of a director, the kind of man who, for good or bad, would never release a film that would stand behind its backstory in import. Perhaps because of all the tensions surrounding the film’s production, he had no real choice but to up and direct a masterpiece. He succeeded. The Shining begins as a relatively sedate story of a family, including wife Wendy (Shelley Duvall) and son Danny (Danny Lloyd) and led by the alcoholic struggling writer Jack Torrance (Jack Nicholson). Jack, struggling with writer’s block, accepts a job tending a grand, large hotel as its winter caretaker, knowing its cavernous emptiness will provide fruitful mental space for his writing. In fact, he’s right, but it provides much more too: a place of such empty despair that he can see into the darkness and find nothing but a tortured, contorted version of himself. Soon enough, he becomes increasingly irate and begins to grow distanced from his family as he has conversations with figures from the hotel’s past which could be ghosts or figments of his imagination. Meanwhile, Danny possesses a special form of ESP called the Shining which holds unknown power but also allows him to connect with malevolent spirits, the same ones which may be taking hold of Jack. It’s easy to see why Stephen King hated Kubrick’s version of his story. For all his defenders, Stephen King has never been the most dangerous, subversive, or nuanced writer or storyteller – he tells ghost stories. Kubrick is more interested in questioning the very idea of a ghost story by making us the ghost. If King wanted to draw us into the mind of an unreliable narrator, Kubrick wants to make us the unreliable one through challenging the very idea of the audience/ storyteller relationship. This is not an attempt to draw us into Jack’s mind – he is distant from beginning to end, with Kubrick’s clinical, boxed off framing very much setting the film aside for us to observe from above rather than to become part of the story. His distance is oppressive and maddening – when we want to become involved, he refuses to allow us any such semblance of care. This is his story, and he’s not about to make us a part of it. Ultimately, he wants to keep us away from the film – and because he does, we can never truly know anything about what happens within. Any psychological interpretation which derives its internal coherence only from the psyche of Jack collapses in comparison to the sheer psychic charge of Kubrick’s filmmaking. The film is, in other words, a dialogue between filmmaker and audience with Jack less as a mediator than a red herring. Despite King’s objections, Stanley Kubrick is the perfect director for the material. Obsessive, analytic, cold, and detached, he turns the film into a study of the unreliable narrator – meaning Kubrick, not Jack – as we come to doubt everything he gives us. Kubrick distorts the filmic world, giving us angular images and the sheer imposing, detached monotony of daily life in the Overlook as he plays with perspective and causes us to question the safe spaces we once held dearly to – the Overlook is a wonderful set of limitations, and Kubrick more than anything knows how to bend and twist limitations to the point of anguished crying out for help. The film progresses slowly as it details Jack’s descent into hell. As the film lurches forward, it takes us further and further into the heart of darkness and into the very deepness of his soul. Kubrick gives us a profoundly detached world, alone and far off from society, where nothing exists but time for characters to lose themselves. As the film comes to a close, we also wonder about Wendy, initially a voice of reason, but someone who may herself fall victim to the haunted locality. Kubrick doesn’t tip his hand – if anything, he’s intentionally obtuse even when he’s literally covering the screen in blood. His greatest trick is not to imbue doubt in the characters, but to cause us to doubt ourselves as he slowly winds us up over the film’s near two and a half hours. His film breaks and breaks again, quilting an operatic mosaic of solitude and excess, ultimately exuding a kind of paradoxical maximalist minimalism. In other words, the film seems to contradictorily mushroom stylistically – ballooning into excess – as it recedes into nothing, as if using its sheer cinematic girth not to impress us with technical presence but weave a purgatorial shroud that denies us any real ease of access. The film is suffocating, and as the walls of the Overlook slowly seem to close and close in on us we become mired in Jack’s own personality disintegration all while Kubrick erects a thoroughly unsupportable edifice around us, beckoning it to collapse upon us – or beckoning us to collapse inwards – like some sort of demented cinematic Jenga tournament limned with a whiff of the occult. Every shot is held to the breaking point, with Kubrick’s long takes especially famous for dragging us through the mud and instilling in us a monotony of his own making, a particularly corseting caliber of oneiric imagery. He captures, visually, the long drawn out halls of the hotel and the constant chill down the spine that comes from its sheer mundane inhumanity. Yet, though his long takes establish the continuity of dread, they are intentionally angular and distorted – we never get a sense of the place as a physical location, and we are always lost to its ways. There is a sense that it cannot possibly be a real hotel; in fact, it wasn’t, with the whole affair mostly constructed as a giant set to intentionally obfuscate our understanding of its physical space. Thus, the fact that Kubrick goes to great lengths to move around the hotel with his camera in unbroken shots actually distorts and disconcerts even more – we expect because of his moving camera that we will get a sense of the hotel as a contiguous place, and it is anything but. Its geometry is completely irrational, an abstract contortion of contagious, idiosyncratic, alien, raw geometry, and yet it could only exist in the twisted minds of men. Alternating between painstaking restraint and bravura images to throw away any potential safety we may develop in coming to understand his choice of shots, in mastering an illusion of cohesive style, the film instead chooses not to torque our imaginations but lesion our capacity to acclimate at all. Throughout, Kubrick’s shot-selection manages to turn even the wide-open emptiness of the hotel deeply claustrophobic. He emphasizes walls, floors, and ceilings even in shots of expanse. As the characters increasingly descend into madness, so too does Kubrick’s increasingly unhinged direction – he uses static shots throughout the film, excepting a slow-moving, lurching camera to capture monotony and the connected-ness of the labyrinthine monstrosity of the hotel. But toward the end, his camera is let loose upon the characters as it ravages around with an unchained recklessness. It’s as if Kubrick is losing control of the film itself. Elsewhere, the director is at odds with himself again when he layers the film with classical music primed to introduce irony and tension. Visually, he emphasizes negative spaces and the perpetually cold emptiness of the Overlook’s geography – many of the shots, for their great skill, are designed to invite distance and resolute disquiet. And yet the film’s music is as grand and opulent as can be. He uses classical tunes to lend the film a baroque flavor, itself enhanced by the excesses of Jack Nicholson’s toweringly cartoonish, Expressionistic performance and at least one visual moment that, for lack of a better phrase, swallows the floor with its grandiosity. Kubrick is very obviously (mis)managing his filmic language. He gives us a heaving, suffocating, un-containable opulence and stark, static minimalism, two things which shouldn’t go together but which he crams into the tiniest of space with the blunt force of a hammer, as if just to diagnose the chaos that unfolds. While the film is undoubtedly a dour affair, there’s also a significant strain of coal-black comedy running throughout, epitomized in earlier scenes where Jack gets caught up in the lives of hotel workers which haunt him as a product of his mind or the hotel’s. Later, it’s hard not to read a self-conscious cheekiness, a reckless and double-faced cunning onto images of a gushing, towering overkill of blood, in light of the film’s release at the dawn of the bloody, massacre-fueled horror films of the ’80s – it’s as if Kubrick is saying “you want blood? Well you got it!” In particular, the idea of Jack, a man consumed by himself and desolately lonely in the huge halls of the Overlook, is cleverly at odds with the initially dry, low-key blue collar talk populating Jack’s conversations with the presumed ghosts of hotel workers. 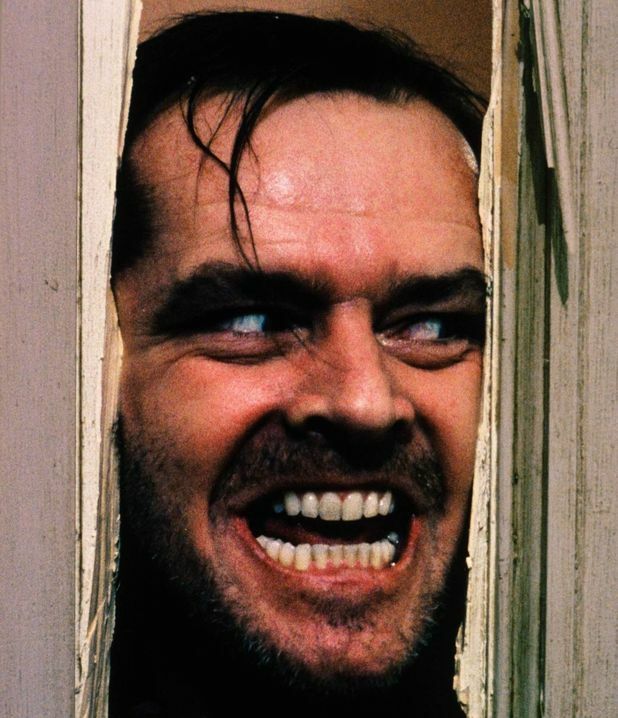 The film is famous for adding new meaning to the phrase “all work and no play makes Jack a dull boy,” and these scenes play like Jack strolling into his favorite bar to unwind after a hard day’s work, all the more self-effacingly when we discover what that entails. The comedy exists more to rub our faces in the psychosis of the whole film, but Kubrick was cinema’s greatest nose-rubber, so who’s complaining? The only constant is the thought that Kubrick was intentionally constructing the world of the film not only for his audience but for his actors. He remained a famously controlling and obsessive director, given to icy intellectualism which fits the movie’s themes of the perpetual solace of the lone artist and the gradual loss of control like a glove. It’s likely that Kubrick saw something autobiographical in the story of a man driven to insanity by a loneliness brought on by the distance between an artist and the world around him. And, naturally, for this reason, he was famously difficult to work with. He would shoot and shoot over and over, we’d like to assume to fulfill his own obsessions. But another possibility exists: in shooting these scenes over and over again, his actors grew to hate him, or at least find him disagreeable even in their admiration. It may be that he was subjecting them to the monotony of the characters they played, ravaging them as he became not only complicit in the madness of the film but, like Jack, its very agent. This entry was posted in Friday Midnight, Review and tagged Confrontational Classics, horror films, Jack Nicholson, literary madness, midnight screening, Score: 10/10, Shelley Duvall, Stanley Kubrick, that cinematography though on September 4, 2014 by jakewalters98.